Chichester's very own gift card has now launched, consolidating the 'Be Smart, Shop Local' theme. This gift card programme will lock in money for local businesses and is a real coup for city as we join others such as Cheltenham, Cardiff and Glasgow. Customers have the choice to spend the card at any participating business (Independents and Nationals) within the city centre, be that a salon, fashion outlet, music store, food outlet, restaurant, leisure venue or bar – the choice for the consumer will be as limitless as the number of outlets accepting the card for transactions. 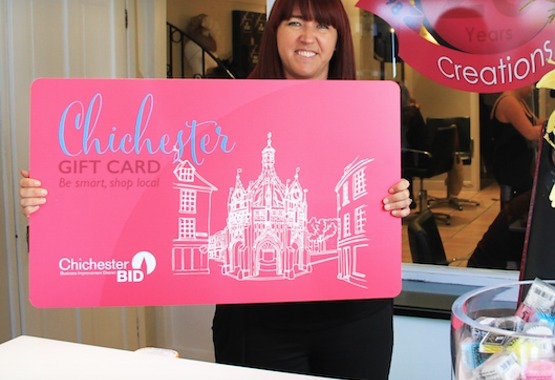 Consumers can buy the "Chichester Gift Card" online on a new website(https://chichestergiftcard.co.uk/) , or from three retail points throughout the city centre (Dartagnan in North St, Creations Hair and Beauty in South Street and the Novium Musuem and Tourist Infomration centre in Tower St). The BID team have also arranged to publicise the Gift Card via a new Digital Pop Up Radio Station, from Spirit FM – called Christmas Spirit. Christmas Spirit will be providing the soundtrack for the season by playing non-stop Christmas songs from 1st Nov – 31st December. The only thing you will hear on this station is the festive cheer of seasonal songs and specific messages from Chichester BID promoting the "Shop Local" theme this Christmas. It will be like your very own Christmas Radio Station. Here is a list of all retailers accepting the Chichester Gift Card.